Box Text: Greetings, terror-trainees! Ickis, Krumm, and Oblina will have to prove themselves on the Monster midterm exams if they want to call themselves real monsters! They must work together as a team to receive a single gruesome grade on their frightful performance. So...go out and petrify someone! 10-13-2012 exonerator Box Text Greetings, terror-trainees! Ickis, Krumm, and Oblina will have to prove themselves on the Monster midterm exams if they want to call themselves real monsters! They must work together as a team to receive a single gruesome grade on their frightful performance. So...go out and petrify someone! This is a list of VGCollect users who have AAAHH!!! Real Monsters (cardboard, Mexico cart) in their Collection. This is a list of VGCollect users who have AAAHH!!! 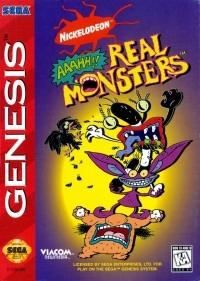 Real Monsters (cardboard, Mexico cart) in their Sell List. This is a list of VGCollect users who have AAAHH!!! 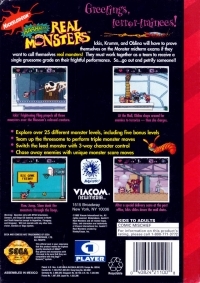 Real Monsters (cardboard, Mexico cart) in their Wish List.